27 February 2007 (Jakarta Post) – Indonesian farmers turn to treasure hunting in times of drought to raise money, oblivious to the archaeological value of the artefacts. It was seven months into the drought last month and the farmers of Pedes district in Karawang, West Java, were at their wits end thinking of ways to make a living. Then one of them hit on something — literally — when he was digging in a field. Beads of gold and stone, ceramics and human bones protruded from the freshly dug earth. “You can’t imagine what it was like to strike gold after being broke for months,” 56-year-old Wijaya, one of the Pedes residents who spent days and nights digging for ancient treasure in one of the rice fields near his house, told The Jakarta Post on Sunday. Living just an hours drive from archeological sites dating back to a prehistoric era did not make Wijaya and his neighbors aware of the historical value of the beads they found. Illegal excavations are common practice in the country, with some fully aware of the fact they are breaking the law stipulating that artifacts that are more than 50 years old belong to the state. Some others, like those who found ceramics and coins in Jakarta’s Old Town, were simply ignorant they were erasing traces of history for the sake of some extra cash. Meanwhile, archeologists are too busy playing Indiana Jones or seeking funding support to preserve ancient sites and the government cannot be relied upon. “The public cannot be blamed for what has happened all too often. We have to support public archaeology if we want to raise community awareness,” said Peter Ferdinandus, a researcher with the National Archaeological Research Center. Public archaeology is a branch of modern archaeology that focuses on increasing public awareness and education about archaeology and that promotes legislative attempts to provide funding and protection for archaeological sites. The federal government has approved a RM12.8 million allocation for the reconstruction of Fortaleza D’Malacca or the mighty A’Famosa fort built during the Portuguese or Dutch colonial era in Bandar Hilir here. Culture, Arts and Heritage Minister Datuk Seri Dr Rais Yatim said said the first phase of the rebuilding work was expected to begin in April or May. Speaking to reporters after attending a dinner hosted by the Malacca state Wanita Umno on Saturday, he said the Cabinet had agreed for the National Heritage Department to quickly draw up the plan with the assistance of historians in Malacca and several archaeologists. The SEAArch podcast speaks to Dr Geoff Wade of the Asia Research Institute at the National University of Singapore about his website, 1421 Exposed. The site was set up up response to the controversial 2002 book, 1421 by Gavin Menzies which claimed that the Chinese admiral Zheng He circumnavigated the world. Find out why Dr Wade set up this website, and the main arguments against the 1421 thesis. 9 Feb 2007 (Jakarta Post) – A sad story about how ancient Hindu temples have been pillaged in Indonesia by private collectors. Many 8th century historical relics from Hindu temples in Central Java have been lost, and are believed to be in the hands of private antique collectors. 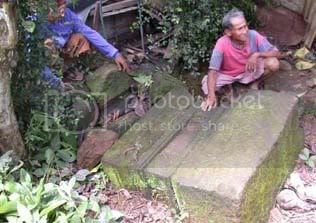 Villager Sukirman, a native of Sidomulyo village in Central Java’s Semarang regency, said that during the 1980s many people came to the area to buy temple ruins or carved stones from residents. During the independence struggle of the 1940s, many temple ruins could be found in the area between Paren hamlet to Sekere Hill in Sidomulyo, Sukirman said. “We considered them to be just temple ruins and of no value, except as black rocks. The government also didn’t take care of them,” he said. As the area became more densely populated, nearly all the temple ruins were tampered with or damaged, and a number of intact statues were bought by middlemen and antique collectors. The project to upgrade Hoi Anâ€™s ancient streets included many underground systems. Thus, every road in the project was dug up as deep as 2 m. Project construction works started in August 2006, right at the same time as a team of archeologists from Hanoi National University and Chieu Hoa University (Japan) excavated 3 sites in Hoi An: No. 16 on Nguyen Thi Minh Khai Road, No. 76/18 on Tran Phu Road and the area around Tran Quy Cap School. 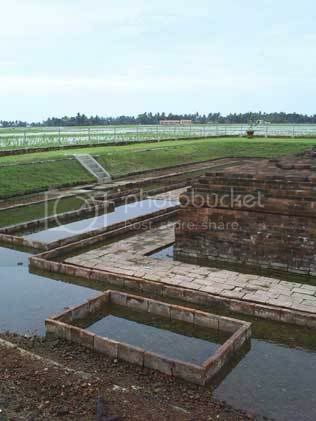 According to several research works, the history of the formation of Hoi Anâ€™s ancient quarters is linked to the Thu Bon Riversâ€™ alluvium depositing process to the south. In the 17th and 18th centuries, the northern bank of the Thu Bon River lied between the current Tran Phu Road and Nguyen Thai Hoc Road, 100 m away to the south of Ong Voi Temple. The wooden structure was found to be the same distance from Ong Voi Temple. Thus, it may have been erected on the northern bank of the Thu Bon River in the 17th century. Also in front of No. 84 on Le Loi Road, Mr. Kikuchi Seiichi discovered 2,401 pieces of glazed terra-cotta, 2,624 pieces of china and 11 Chinese coins, as well as several Vietnamese and Hizen â€“ Japanese pottery works. 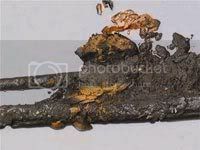 Other remnants included a brick water-escaping site with a sand and clay bottom, 30 cm wide and 22 cm deep. This site dates from the 17th century. The Culture, Arts and Heritage Ministry will table in the Cabinet a report on the research and conservation of caves in Sabah. Minister Datuk Seri Utama Dr Rais Yatim said that with it, there would be a tendency to assist in the efforts, and expenditures for cultural arts and heritage would no longer be considered a wastage. He said that his ministry would prepare the report which contained research and conservation efforts undertaken by the Sabah Museum Department for submission to the federal government so that heritage was viewed as a valuable product of humanity. Rais said he made the visit to get a closer look at the heritage especially the caves in Sabah so that he would be able to convince the federal government on studies and efforts to conserve historical places with heritage elements. Nearly 800 precious bronze and terracotta antiques have been selected from the collections of members of the United Nations Educational, Scientific and Cultural Organization (UNESCO) antique preservation club. The history of Vietnamese wine culture is reflected in the hundreds of tumblers, jugs, decanters, wine brewing pots and jars. Items on display in the exhibition date from the Dong Son era (2,000-2,800 years ago) up to the Nguyen dynasty, with many exotic pieces coming from the latter era.